Brighton & Hove Albion under-23 striker Stefan Ljubicic has joined Eastbourne Borough on loan until the end of April. The 19-year-old will link up with the National League South side, and could make his debut in their game away at Truro City on Saturday. Under-23 coach Simon Rusk said, “Stefan has made good progress here, successfully moving up into the under-23 age group at the start of this season. 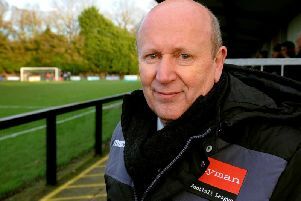 “We felt it was in the best interests of all concerned for him to go out on loan, and play in a very competitive National League South division. Ljubicic has made five league appearances for Albion’s under-23s this season, and featured in the Checkatrade Trophy match away at MK Dons. He is also an Iceland under-21 international, making his debut in a 1-0 defeat to Northern Ireland back in October. Borough manager Jamie Howell added, “We are delighted to bring Stefan into the squad. He is a player with great potential and we look forward to working with him. “With Joe Quigley’s loan deal expiring, it was important we brought someone in. I’m sure Stefan will be a great addition and one the fans will enjoy watching.